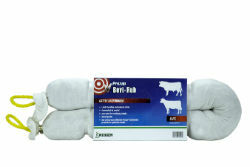 Designed for effective and economical control of flies, grubs, lice and ticks on cattle, swine, and other livestock. Superior insecticide charging and wicking action allows for low-stress application of insecticides on cattle and other livestock. Prozap® Bovi-Rub limits stock handling and aids in the reduction of harmful external parasites. Hang near water, mineral feeders, or in alley ways to encourage use. Initially charge with 1 to 2.5 gallons of solution and recharge as necessary to maintain wetness.